THE West McLaren Mercedes team will remain the same next season with David Coulthard, Kimi Raikkonen and Alexander Wurz. Mika Hakkinen, the double World Champion who has been (officially at least) on "sabbatical" this year has announced his retirement from the sport. This is no big surprise. 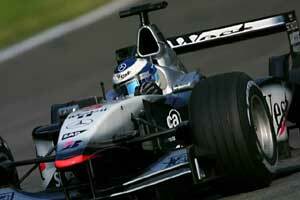 "At the Monaco GP in 2001 I informed Ron Dennis that I wanted to stop," Hakkinen said. "He wanted to make sure that I made the right decision and gave me the opportunity to take a sabbatical. Once I had spoken to Ron a huge weight came off my shoulders and I really enjoyed the rest of the season. I have been through a lot in my F1 career and I really did not think it was worth it to push things any further. I want to spend time with my family." Ron Dennis gave Hakkinen a suitable send-off. "I want to thank him for everything he has done and achieved for the team during his nine-year career with McLaren," said Dennis. "I know it has not been an easy decision for him to make and the team and myself want to wish him and his family all the best in the future." Alex Wurz's decision to stay as test driver at McLaren is an interesting, with the Austrian clearly feeling that there may be a chance that the team will run three cars in the future.